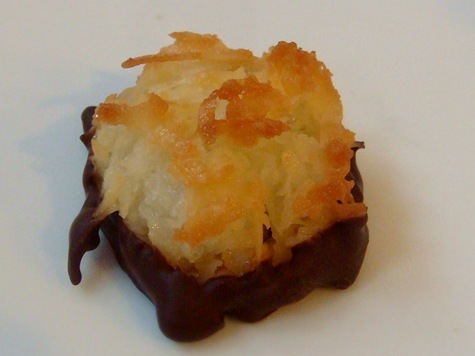 DAY 12: For our final Christmas cookie this season, a traditional coconut macaroon. This is a flourless, gluten-free cookie made from coconut, egg whites, sugar and almond extract. They can be made sugar-free as well by using unsweetened coconut and a sugar substitute. The ones pictured here are the full-sugar variety. The “dough” is cooked on the stove prior to baking, which leaves you with a wonderful chewy macaroon on the inside and slightly crispy toasted coconut on the outside. Dipping the bottoms in chocolate is optional, but I definitely recommend it. In a medium saucepan, stir together coconut, egg whites, sugar and salt. Cook over medium heat for 10 minutes, stirring constantly (a spoon drawn through the mixture should leave a clean path). Remove from heat; stir in almond extract. Drop onto greased cookie sheets (or line with a Silpat) by rounded teaspoonfuls. Let stand on cookie sheets for 15 minutes before baking. Bake for 18-20 minutes, until lightly browned. Cool on pan for 2 minutes before removing to wire rack. Cool completely. So glad you liked them. Hope you enjoyed a wonderful Christmas. I made Ina G’s macaroon recipe and they spread too much inside the oven. This recipe is a dream compared to hers! Much easier and a prettier result. I would recommend less almond extract, though, as it can be overpowering. I am happy that they worked out for you. Almond extract does tend to vary by brand and should be added sparingly at first.